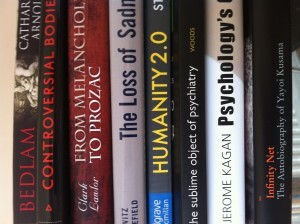 Reading the Mind, The Maudsley Book Group. One year ago I decided to start a book group. Bang on trend for 2011 eh? However, this wasn’t any old book group, this one had decidedly high falutin’ aims. With psychiatric training focusing increasingly on competencies and MRCPsych requirements, there seems little time left for learning about concepts critical to the development and history of psychiatry and related fields e.g. psychoanalysis, psychology, philosophy, sociology, anthropology, neuroscience etc… Such disciplines can be hard to access for the uninitiated and a medical training doesn’t help much to furnish one with the necessary critical tools to appraise, say, a philosophy of mind book however relevant it might be to psychiatry. Thus Reading the Mind was born; unashamedly educational and aimed at psychiatric trainees wanting a little bit more. Our first book was The Divided Self by R D Laing (1960) a seminal work by a key figure in the anti-psychiatry movement critiquing the biological model of schizophrenia. Here Laing reworks psychosis as an understandable response to intolerable pressures placed on the patient by society and the family. This was followed by Notes Upon a Case of Obsessional Neurosis by Sigmund Freud (Rat Man) (1909), a great introductory text to Freud’s core concepts of psychopathology, particularly neurosis, and an exemplar case history on the descriptive phenomenology of OCD. Next, we discussed Consciousness Explained by Daniel Dennett (1994), an influential and contemporary philosophical critique of the paradigm we use to think about consciousness outlining the foundation for his own theory of consciousness. Opening Skinner’s Box by Lauren Slater (2004) provided the group with a run-through of the ten most important psychological experiments of the 20th Century and in doing so provided a crash-course in the recent history of Psychology. We then read The Loss of Sadness by Allan Horowitz and Jerome Wakefield (2007) a devastating critique of the current concept of depression within psychiatric nosology; Illness as Metaphor by Susan Sontag (1978) a brilliant essay on the dangers of reducing illness to metaphor and the pervasive effect on doctor, patient and society; Winnicott by Adam Phillips (1998) a welcome introduction to his life, work and key concepts, and finally, The Mask of Sanity by Hervey Cleckley (1941,1982) a seminal study on the psychopath. Grounded in case studies, it profiles and refines the concept of the psychopath, and was used heavily by Robert Hare in developing his PCL checklist. Our next meeting is on Tuesday 22nd May and we’ll be discussing Anthony Clare’s Psychiatry in Dissent (1980). Unfortunately, due to our funding, Reading the Mind is only open to Maudsley trainees. However if you’re interested in starting a similar book group then please get in touch. Dr Lisa Conlan, ST6 General Adult Psychiatry, SLAM.